This edited collection examines time and its relationship to and impact upon media industries, studying how the media industry views time and makes business and economic decisions based on considerations of time. Contributions from an international set of authors analyze time constraints and competition between different media; the quantity and quality of time spent in media consumption, audience and readership time valuation/costing/pricing; and the emergence of new media businesses around individual time management. * a summary of research and an agenda for future research on the topic of time's role in the media industry and markets. 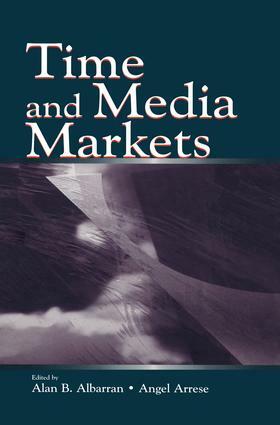 With its origins in the third World Media Economics conference, held in 2000, Time and Media Markets is a distinctive and important collection appropriate for scholars and advanced students in media management and economics. "For researchers with interests related to time and media questions, the book can be a helpful source and a valuable foundation for developing and expanding study in the area." "…Time and Media Markets contains nine studies for our consideration. The result is a book that has the breadth of a good conference and the rigor that comes from review….The strength of the book lies in the ideas rather than the evidence. While narrowly focused, challenging theoretical investigation is sorely needed in media scholarship. Even if one doesn't wish to investigate time, the process of breaking apart a construct and rigorously evaluating it a worth academic exercise." Contents: Preface. A.B. Albarran, A. Arrese, Time and Media Markets: An Introduction. J. Durand, Media and Representation of Time. D.G. MacDonald, J.W. Dimmick, Time as a Niche Dimension: Competition Between the Internet and Television. R.G. Picard, M. Grönlund, Temporal Aspects of Media Distribution. D. Shaver, M.A. Shaver, The Impact of Concentration and Convergence on Managerial Efficiencies of Time and Cost. M. Medina, Time Management and CNN Strategies (1980-2000). D.H. Goff, Online, Time Is Money: Internet Growth and the Cost of Access in the United Kingdom and Europe. F.J. Pérez-Latre, Advertising and Internet Usage: A Perspective From Time and Media Planning. A. Nieto, Media Markets as Time Markets: The Case of Spain. P.F. Phalen, Trading Time and Money for Information in the Television Advertising Market: Strategies and Consequences. A. Arrese, A.B. Albarran, Time and Media Markets: Summary and Research Agenda.